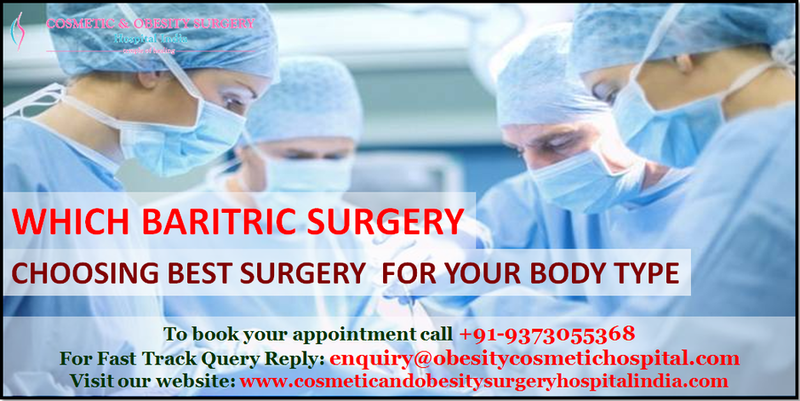 Bariatric or Obesity surgery procedures are much sought after today owing to the rapidly growing obese people in the society. There are many types of Obesity procedures, each of which is helpful in its own way. These procedures limit of amount of food intake that is restrict the food quantity, which the stomach can hold. India is equipped with all of these procedures and is efficiently offering these services to worldwide patients. Today there are many Bariatric procedures that are performed using minimally invasive techniques. Gastric Sleeve – In this procedure, almost 80 percent of the stomach is removed and the remnant portion is like a small pouch that is the new stomach, which can hold very limited amount of food, and this whole process results in less consumption of calories. Studies show that this is an extremely effective procedure for weight loss and also helps in the reduction of Diabetes. Gastric Band – This surgery involves an inflatable band that is positioned around the upper section of the stomach, which creates a small stomach pouch above the band, and the remaining stomach portion below the band. The feeling of fullness depends upon the size of the opening formed by the band, between the pouch and the remaining stomach area. Gastric Bypass – This procedure involves creating a little 15 to 20 cc pouch at the top of the stomach. Then, the small bowel is divided, the bilio-pancreatic limb is joined again to the small bowel and the other end is the joined to the pouch, creating the Roux limb. The small pouch discharges the food slowly, causing a sensation of fullness to the patients and thus encourages very little food intake. This leads to 60 to 80 percent of long term weight loss. Gastric Balloon – In this surgery, the Gastric Balloon is inserted into the patient’s stomach through the Esophaegus. This is done by using a thin flexible tubular shaped instrument, which has a camera at the end of it. A mild sedative may be used for this; but usually this surgery is painless and the patient can leave for home the same day. Mostly, after six months, the balloon is deflated otherwise there is risk that it may get depreciated after a certain period of time. Although the amount of weight loss varies from patient to patient, mostly there is 20-30 percent of weight loss. Duodenal Switch – In this procedure, first, a smaller, tubular shaped stomach pouch is created by removing a section of the stomach, and then a large portion of the small intestine is bypassed. Initially, this procedure helps in reducing reduce the amount of food consumed; but as the patients get used to this routine, they are able to consume lesser amounts of food. Which Procedure is the best for you? Every Bariatric procedure has its own pros and cons. Your doctor will be doing a very good evaluation of your health and medical history. Depending on all of this, your doctor chooses the best possible procedure for you, which can give you the best possible result that is maximum weight loss. How much maximum weight can an individual lose? The outcome of every procedure depends on variables like the age and medical condition of the patient. Also a lot depends on how much the patients follow the restrictions and guidelines associated with the procedures. So, the Gastric Bypass procedure assures 60-80 percent long term weight loss, the Gastric Band procedure brings weight loss of about 40-50 percent. Thus, it varies for every procedure and patient. We at Cosmetic and Obesity Surgery hospital are well aware and affordability is quite an issue for innumerable medical tourists and that’s the reason they are choosing India. While in India, these international patients can reap the benefits of huge cost benefits related to Bariatric procedures. For example, the Gastric Sleeve procedure in USA costs $16,500 whereas these patients can avail this for $6,000. It was nice to read about them. Keep on sharing your awesome article here and on https://www.aussieessay.net/ this website. Okay?